I’don’t know if you noticed but this site is all about julienne peelers. But until now I haven’t written a post about the julienne peeler it self. Yes, I have written many articles about julienne recipes and reviews about julienne peelers but not about the utensil it self. Julienning is an culinary knife cut technic learned in chef schools. 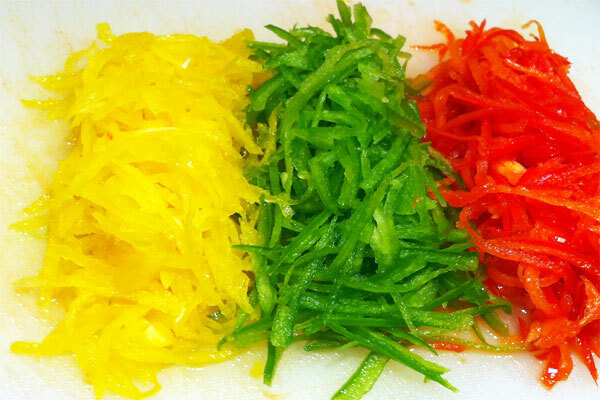 We understand under the art of julienning the following: cutting vegetables into long thin strips, similar to matchsticks. The perfect julienne cut measures ⅛ x ⅛ x 1 to 2 in (3 mm x 3 mm x 3 to 5 cm). The technic most of the time applied on vegetables but can also be applied on meat, fish, fruits. When it comes to julienne peelers I wouldn’t julienne meat or fish but only vegetables and some fruits. Peelers come in all sizes and forms. You have all kind of peelers. The kitchen tool consists of a metal blade attached to a handle that is used for skinning vegetables or for julienning or for make slices. On potato peelers you sometimes can find a paring knife. The difference between a normal knife and a peeler is that a peeler has two blades. One to cut the skin and one to prevent of cutting to deep. This can differ from person to person. You need to know what is important for you when using a julienne peeler. Here follows a list of features and qualities a peeler can have. Are you left are tight handed? Can you use the peeler in two directions? This is very important when you are used to peel in a certain direction especially when you are left are right handed. Which color do you like. As you can imagine, it’s a smal kitchen tool but you have lot to think and choose about. It differs from person to person. Are you a chef or a house mom or dad. How many times are you going to use the julienne peeler? Are you making lots of julienne or ones in a month. Maybe a mandolin or an electric kitchen add is beter for you. It all depends on how often you make julienne and how many.